In 2015, the Alter-Ciné Foundation received 70 documentary submissions from 36 countries. Indian and Pakistani co-directors Miriam Menacherry and Maheen Zia received a 5,000$ award for their project Lyari Notes. In Pakistan a rock star, Hamza Jafri, teaches a group of girls to express themselves through music in Karachi's most volatile district. He travels in an armed vehicle. He is a musician famous for his hard hitting political lyrics since the 1990s. Since then religious fundamentalism has been on the rise with shops selling music torched, concerts bombed and musicians threatened with death. Seeing the shrinking space for music and artists Hamza decides to fight back by opening a music school. Captured over 3 years Lyari Notes is the narrative of four young girls who attend Hamza's music school and learn what it takes to express oneself despite the cycles of violence. Eliane Raheb, recipient of a 5,000$ Alter-Ciné Foundation grant. 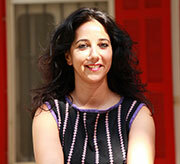 Lebanese woman documentary-maker Eliane Raheb was awarded a 5,000$ grant for her film The Great Family. Marlene, a French adopted girl from Lebanon, is investigating her roots to retrace her Palestinian identity within the ruins of Tal Al Zaatar. The Tal Al Zaatar camp only remained alive through testimonies of its survivors who have never been able, even 40 years later, to digest the horror they have lived on the 12th of August 1976. As the film goes along, solid ties will be built between Marlene and the survivors of Tal Al Zaatar and connections that will make her feel she found a great family. The film aims at engaging a reflection about human beings overcoming the loss of their loved ones and finding a new meaning to life. Nicole Schafer, recipient of a 5,000$ Alter-Ciné Foundation grant. 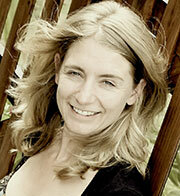 South-African filmmaker Nicole Schafer received a 5,000$ award for her project "Buddha in Africa". In a Chinese Buddhist orphanage in Africa, we meet Enock Alu, one of 300 orphans from across rural Malawi growing up between the contrasting worlds of traditional village life and the strict discipline of the Confucian, Buddhist value system of the Chinese. Reminiscent of the Christian mission stations during colonial times, here African children with Chinese names speak Mandarin, revere Buddha and go through a gruelling process towards mastering the difficult art of Shaolin Kung Fu. Once the star performer with dreams of becoming a Kung fu hero like Jet Li, Enock, in his final year at school, has to make some tough decisions about his future and finds himself torn between returning to his relatives in the village or going abroad to study in China. Against the backdrop of China's expanding influence on the continent, the film evokes some of the tensions and uncertainties surrounding the growing relationship between China and Africa. 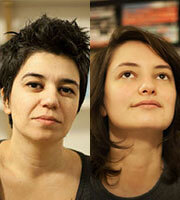 Burcu Melekoglu and Vuslat Karan, recipients of a 5,000$ Alter-Ciné Foundation grant. Turkish co-directors Burcu Melekoglu and Vuslat Karan received 5,000$ for their film "Blue ID". A transgender man, once a famous female fashion model, struggles with self-realization and acceptance in traditional society of Turkey. Constrained by identification cards color-coded for gender, will he finally be considered for a Blue ID? Alberto Saul Arnaut Estrada, recipient of a 5,000$ Alter-Ciné Foundation grant. 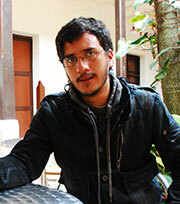 Mexican filmmaker Alberto Saul Arnaut Estrada received a 5,000$ grant for his film "Hasta los dientes" (To the Teeth). On March 19 2010, the Mexican government announced that two killers, armed to the teeth, had been killed in a shoot-out with soldiers in the city of Monterrey. Soon it came to light that the two "killers" were in fact university students, Jorge Mercado and Javier Arredondo, who had been tortured before being killed by the military. The army tried to get rid of their bodies by throwing them into a mass grave. As the parents begin to ask questions, and establish the innocence of their sons, they discover that the murders are far from an isolated case.